Classic Film and TV Café: This Week's Poll: What's your favorite film set aboard a submarine? This Week's Poll: What's your favorite film set aboard a submarine? Cramped quarters. Poor air circulation. Spies lurking among the crew members. Threats of depth charges, enemy torpedoes, underwater volcanos, and giant squids! It's no wonder that submarines have provided a memorable cinematic setting for everything from tense war films to colorful science fiction to comedy. But what is your favorite movie set aboard a submarine in the classic film era? Destination Tokyo. Cary Grant commands the Copperfin, a World War II submarine navigating through enemy waters. His crew includes John Garfield as Wolf and Alan Hale as Cookie (perhaps, this was the beginning of nifty names for sub crew members). Directed and co-written by Delmer Daves, the film's climax places in the Copperfin in an underwater mine field. Das Boot (The Boat). Wolfgang Petersen's art-house picture, set aboard the cinema's most claustrophobic German U-boat, became an unexpected worldwide hit in 1981. At the time, it was the second most costly German film, trailing only Metropolis. 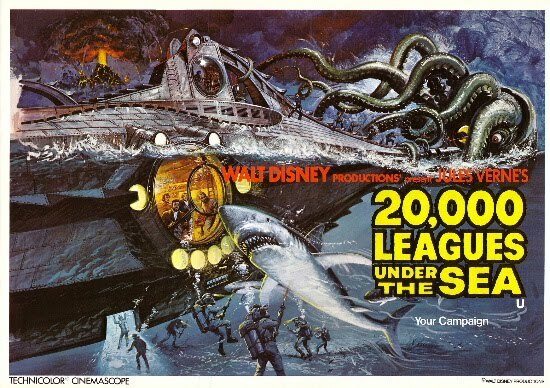 20,000 Leagues Under the Sea. Walt Disney's fanciful adaptation of the classic Jules Verne novel increased the "cool" quotient for submarines significantly. The Nautilus looked spectacular, featured an offbeat commander (James Mason as Captain Nemo) who played an organ, and there's that famous giant squid fight, too. 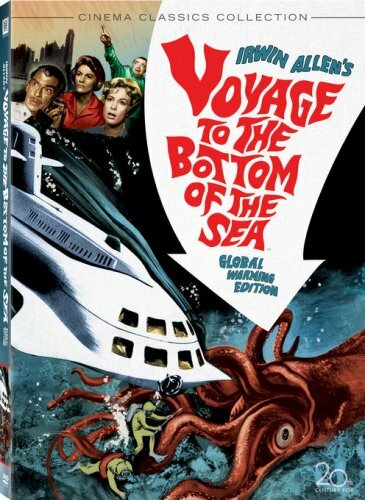 Voyage to the Bottom of the Sea. Vote the film and you get the TV series for free--or vice versa! Both featured the super sub Seaview and its inventor Admiral Harriman Nelson (Walter Pidgeon in the movie and Richard Basehart on TV). Enemy subs, giant octopus, aliens...the Seaview faced them all! Fer-de-Lance. Long before there was Snakes on a Plane, this was this nail-biting 1974 made-for-TV movie pitting David Janssen and Hope Lange against poisonous snakes running amok aboard a submarine. A cult classic from the Golden Age of TV Movies. Ice Station Zebra. Allegedly, this Alastair MacLean adaptation was Howard Hughes' favorite film during the billionaire's later life. 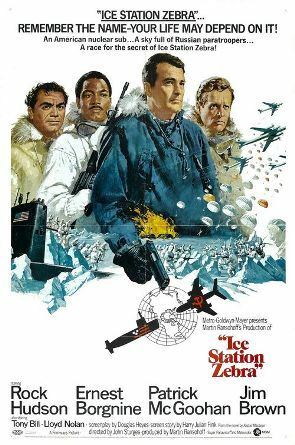 It's not hard to guess who the spy is aboard the submarine headed to the Arctic on a secret mission, but Rock Hudson, Patrick McGoohan, Ernest Borgnine, and Jim Brown make it fun. 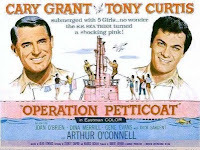 Operation Petticoat. The most famous submarine comedy has Cary Grant (again) as the Sea Tiger's commander and Tony Curtis as his inventive (but sneaky) supply officer. Their routine existence is turned upside down when they have to transport a group of nurses (Joan O'Brien, Dina Merrill, and others). Rick, you also left off the list the Tyrone Power Dana Andrews classic Crash Dive , and John Wayne in Operation Pacific. I know...I've thought of even more, such as TORPEDO RUN with Glenn Ford, MYSTERIOUS ISLAND (the Nautilus again with Herbert Lom as Nemo), and YELLOW SUBMARINE. Let's face it...there are a bunch of submarine-set movies! 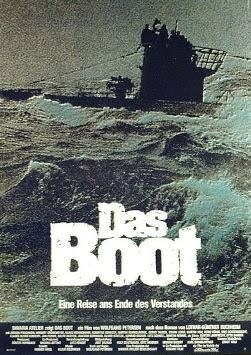 DAS BOOT should win, if for no other reason than it's the most fun to say. So true, Sark, but FER-DE-LANCE is fun to say, too. Literally translated, it means that Lance isn't located far away. CRASH DIVE definitely belongs on the list. :) But I voted for what is probably the first submarine movie I ever saw, which I still love: OPERATION PETTICOAT. Das Boot is definitely fun to say. I think it is also the best submarine movie on the list, although I like many of the others. If the Cafe considered newer movies, I would have to include K2,The Widowmaker. I will never forget first seeing Das Boot and forgetting that these guys were the enemy, finding myself rooting for them and celebrating their victory over what I realized was a ship of OUR men. Very interesting psychological experience. Paul, I can't believe you didn't vote for VOYAGE TO THE BOTTOM OF THE SEA! My first fan letter as a kid was to 20th Century-Fox, which sent me a little b&w photo of the Seaview (which looked quite real). I used that photo for "show and tell" in school for years! Rick., Ii did not want my dads memory to control my vote.BTW I think we should have a poll with the films you left off your list.I just remembered The Enemy Below, and Hell And High Water. I must tell you that Crash Dive is one of my wife's favorite films and when I told her you left it of the list she said "WHAT!!!!" 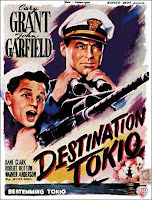 Rick, Operation Petticoat has my vote.. Destination Tokyo, is also good.. Hey wait!!! Rick, I knew that's what FER-DE-LANCE meant. I also know that DAS BOOT refers to a boot belonging to Da. Thrilled to see that "Fer-de-Lance" was included in this poll. It's a terrific movie that scared the crap out of me as a kid. I don't like snakes. Being trapped on a sub with them gives me the heebie geebies just thinking about it. This thread has some great humor. Like Anon, the thought of snakes while being trapped on a sub would bring on a major case of heebie jeebies! Sark and Rick, I think there is dis boot, das boot, and de udder boot, too. But the most important character in "20,000 Leagues Under the Sea" was that singing sailor Kirk Douglas, who voiced that classic Disney song "A Whale of a Tale."